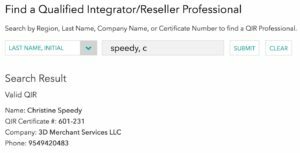 Christine Speedy is Qualified Integrator and Reseller certified by the Payment Card Industry Security Standards Council. 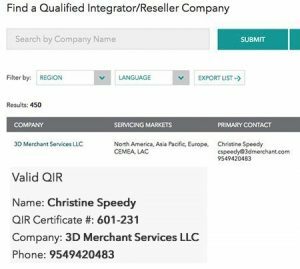 QIRs are integrators and resellers specially trained by PCI Security Standards Council to address critical security controls while installing merchant payment systems. QIRs reduce merchant risk and mitigate the most common causes of payment data breaches by focusing on critical security controls. The council changed the QIR certification requirements after my certification in an effort to reduce barriers to certification, both financially and with the depth of training. While QIR certification always was for individuals, they were tied to companies. The tie to companies has been removed so as they change jobs the certification is not disrupted. Due to this change, the PCI council recently updated the web site search navigation. My company used to be the first listing when you clicked on the QIR link. 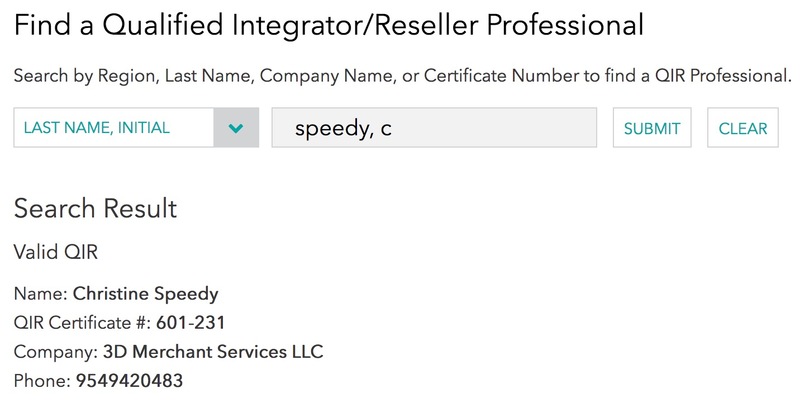 Now, the only way to find me or any other QIR certified person is to do a search. Before PCI QIR certification requirements change. After PCI QIR certification requirements change. 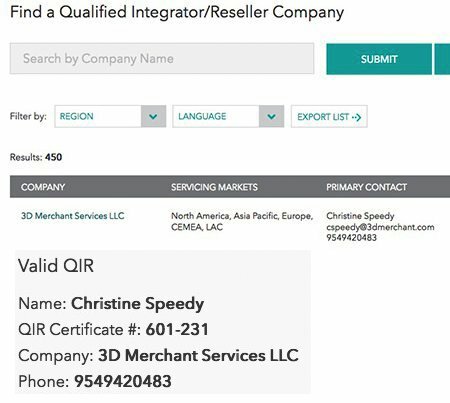 While the Visa QIR mandate is for Level 4 merchants with card present transactions, I recommend that all merchants use QIR individuals for all transaction types. There’s a false sense of security that consultants and developers are guarding merchant security, but literally every day I find problems with companies of all sizes. Level 4 merchant is defined as less than 20,000 Visa or MasterCard e-commerce transactions annually, and all other merchants processing up to 1 million Visa or MasterCard transactions annually. The Christine Speedy difference. PCI compliance is important to mitigate data breach risk, but equally important is compliance with complicated card network rules. Have you read any of the 1,000+ pages of Visa Rules? Or 300+ Mastercard transaction processing rules? Have any of the people you rely on? I’ve spent countless hours educating myself on them and learning about the nuances that impact your profit and risk. Technology directly impacts compliance. It doesn’t matter how big or how old a company is; the reality is most players in the payments industry fall behind with every new rule that comes out, even though these rules are usually announced years in advance so that they can prepare. Christine Speedy, QIR certified payments professional can be reached at 954-942-0483, 9-5 ET. This entry was posted in PCI Compliance, security and tagged christine speedy, PCI compliance, QIR by Christine Speedy. Bookmark the permalink.